We want to send out a GREAT BIG THANK YOU to Tony and Kim Guessford for their generous donation of their vehicle! It is a Honda Accord, 5 speed. The car is state inspected and ready to be given to a Veteran in need! First, HAPPY NEW YEAR! The past year has been very busy for us. As you can see, we have not kept our website up to date. We do, however, have a FACEBOOK page that is kept VERY active! So, with that being said, we are going to be making a more conscious effort to update this website every week. As we look back on 2015, we have passed our 2 year anniversary in September. There continues to be new joining our group every month. We have had a generous donation of a 2004 Jeep Liberty to be given to a Veteran in need, should one present itself. Well...it DID. We will be handing the keys to a local Marine Veteran that connected to us through a doctor that one of our members sees. As we enter 2016, our 3rd. year, we are excited about the momentum of the group. In the very near future, there will be a "painting therapy" class in Febuary. We are setting up a "field trip" for our members to visit the Marine Corps museum and other sites near Washington, D.C.
Also, we are taking orders for long sleeve t-shirts and sweatshirts that have our logo on the front and back. We still have short sleeve t-shirts available. If you would like one, please send us an email via our "contact" tab on this site or send us a FACEBOOK message. We want to make it known that EVERYONE is welcome to our meeting, not only Veterans. 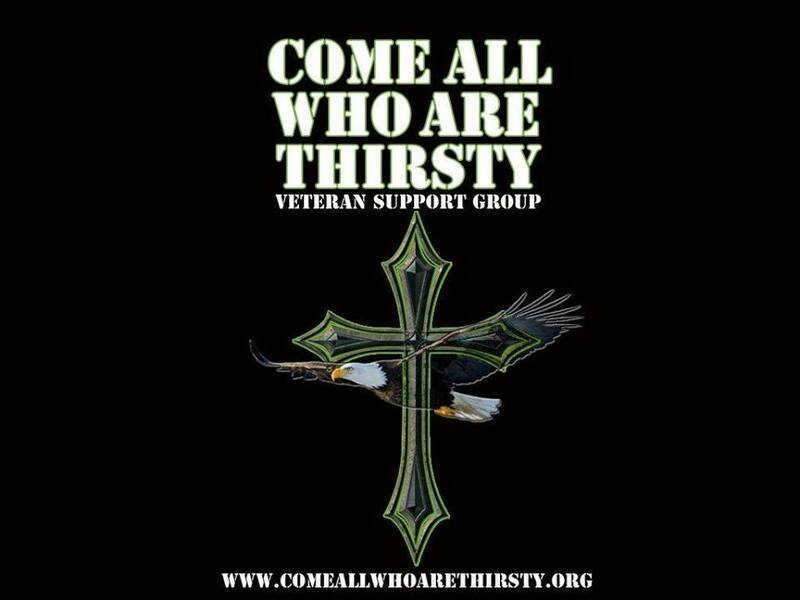 We meet as a large group, then break down into small groups of Veterans and non-Veterans. The Veterans go one step further and seperate male / female small groups. On a side note, ALL police, fire, and EMS are welcome to attend the small group sessions. Our beliefe is that the first responders are on the front line and in harms way, just as Veterans are, but in a different capacity. Thank you for visiting the website and we look forward to seeing you at the meeting. Our meetings are the FIRST Saturday of every month, at 9:30 am. Breakfast is served. Our meeting location is 3904 Mills Rd. Sharpsburg, MD 21782. Please say hello to the President of Come ALL Who Are Thirsty, Bob Walters. About five years ago, Bob was diagnosed with a brain tumor. After several appointments, it was decided that there was no reason to make any attempt to remove it because it was not growing or moving. About a month ago, Bob went for a routine visit and the neurosurgeon saw that the tumor was starting to grow and needed to be removed. Bob is a patient of the Martinsburg, WV Veterans Hospital. That facility does not have the proper medical care for Bob, so they referred him to the Baltimore Veterans Hospital. Well, as it turns out, Baltimore does not have the correct physician either. So, they in turn referred Bob to the University of Maryland Hospital in Baltimore. Bob is scheduled to get the tumor removed on May 5th 2015. FINALLY Bob was going to get the care he MUCH needed and deserved. This morning, April 10, 2013, Mrs. Walters received a phone call from the Directors office at the Martinsburg VA. That phone call tarnished any and ALL light of hope that her soul mate will continue this walk with her...The Director at the Martinsburg VA reported the he would NOT approve the surgery for Bob. Being Bob is a patient there, the cost would have to be absorbed by Martinsburg and it was not in the directors budget to pay for it. So, as you can imagine, Mrs. Walters and Bob were devastated! Mrs. Walters reached out to one of the Co-Founders (Directors) of Come ALL Who Are Thirsty, Dwayne Harris. Mrs. Walters explained the situation and said she did not know where to go from here. Dwayne reassured her that this WAS going to be taken care of. His first call was to a Veterans Representative in Frederick, MD. They in turn told him to call the number given which was the Director of the Veterans Hospital in Baltimore, MD. When Dwayne called the Baltimore VA hospital, he was connected to "Denise" which was the secretary of the director. He explained the situation, and she began to work on it. Dwayne then called Congressman John Delaney's office and spoke with "Sam" one of his aides. Sam also began to get to work on it and mentioned that Congressman Delaney is on a hard drive to correct the flawed Veterans Administration's medical system. The next phone call Dwayne made was to the Secretary of the Veterans Administration, Robert McDonald. He left an extensive voice mail. Later that afternoon, there were several phone calls to include local news station WHAG's Nick Munson. Mrs. Walters called Dwayne back and told him that the Baltimore Veterans Hospital Director said they would cover the cost of the medical that Bob needs! Mr. Munson showed interest in doing a news story on this situation and the community outreach that Come ALL Who Are Thirsty is involved in. Also, it is in the works to possibly have a private meeting with Congressman Dulaney so that this issue can be corrected so that there is not a tragic ending. Thank you to ALL that took part and made this tragedy have a HAPPY ENDING!!! It has been a VERY long day for all parties involved. Please keep Bob and Mrs. Walters in prayer and stay tuned.....oh....YEA GOD!!! Today was a great meeting! We were honored to have two guest speakers. Melissa Barber, the Regional Resource Coordinator (Western Maryland) for the "Maryland's commitment to Veterans" organization spoke to us about the services they offer to Veterans. Also, Tracy Seffers, Chapter Coordinator from "Team River Runner-Shepherd" spoke about a an adaptive, therapeutic kayaking program to assist Veterans with things such as PTSD (post traumatic Stress Disorder), TBI (Traumatic Brain Injury), amputation, spinal cord injuries, and other disabling wounds. We gave certificates of appreciation to Teresa Copoulos (Speaker of the House) and Pete Stotelmyer (former Vice-President) and also to our guest speakers today. So, we want to make sure we remind everyone to take a moment tomorrow, Sunday December 7th, to remember that 72 years ago the United States suffered a brutal attack on Pearl Harbor in which 2,500 Americans died and over 1,000 others wounded. The USS Arizona was bombed 4 times, totaling HALF of the causalities that day. Never forget! Take a minute to think the ones that stepped up and served in the military this holiday season. If you see a Veteran, please thank them for their service. Merry Christmas and have a very safe and wonderful holiday! This month meeting went well. Again this month, as history has shown, we have added yet another Veteran to our group. Every month, consistently, there has been at least one new person that joined our group. The emphasis of discussion this month was the new threat from ISIS that specifically targets Veterans, first responders and their family members. The information received from the DoD and Army Threat Interrogation Center discusses that there is details emerging that needed to be passed to the group so we can share it with our family members. The bottom line is be vigilant about what information is shared on social networks. We are in the very early stages of expanding to a second chapter of "Come ALL Who Are Thirsty." Monday, November 3 in Sharpsburg, MD Dwayne and Beth will be attending the town council meeting and discussing the option of creating the Sharpsburg Chapter! The next regularly scheduled meeting is Saturday, December 6th at 9:30. There will be great food, special music, a brief "year in review" and some member recognition! 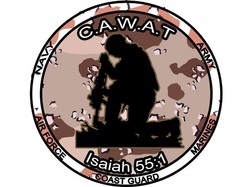 One year ago, there was a vision given to a RETIRED U.S. Army Command Sergeant Major that, through God's strength alone, she chose to carry out. This was a mission that would require patience, determination, and courage. Through a series of conversations, this vision slowly to come to life. A team was gathering that had one common core feelling....the love for our FREEDOMS and the love for the ones that walked to the gates of hell to protect them! It was noticed that there were not many services for the Veterans im a small town that was rich with Veterans and family members there of. The military suicide rates is on an ALARMING rise, currently set at 22 military suicides per day! So, this one courageous CSM said to God..."SEND ME!" Come ALL Who Are Thirsty was born! During this one year, there were some amazing milstones met and hurdles crossed. There was an executive board created, bank account established, website and FaceBook page created, buisness cards, T-shirts and fliers created, and the list goes on and on! Our members have worked VERY hard at making this vision come to life because they BELIEVE in what they are doing, there is a sense of purpose and urgency in the air. Our group has conducted a fund raiser for a soldier that lived in Thurmont, MD that commited suicide because of his hard fight with PTSD and assisted the family with over $1,000 raised. We assisted a Marine, triple amputee with funds to help his mother to move back to North Carolina, had two of our members speak on a local radio show and been invited to make an appearance on a local TV channel that speaks of Veteran's related issues. It has been a GREAT and BUSY year and the team has worked extremly hard to move this vision into a reality! All because this one retired Soldier said YES!